This post has been sponsored by Egg Farmers of Canada and we have been compensated monetarily. As always, all opinions are our own. It seems like every day is a national holiday. Just take a scroll through your Instagram feed on any given day and I guarantee it is some sort of special food holiday. But today, today takes the cake. October 12th is World Egg Day! A global celebration dedicated to the one and only egg. Not that we need an excuse to get together with friends and family and cook up some eggs. You will always ALWAYS find a carton of eggs in my fridge. If you’ve got eggs on hand, you are always mere minutes away from having a satisfying meal on your table. Eggs provide protein, 16 essential nutrients, and most importantly, they taste delicious. And the best part? My kids love them! So you will find eggs on my table pretty much any time of day. That’s one of the amazing things about eggs – they aren’t a one trick pony. They can be eaten about a million different ways, any time of day. 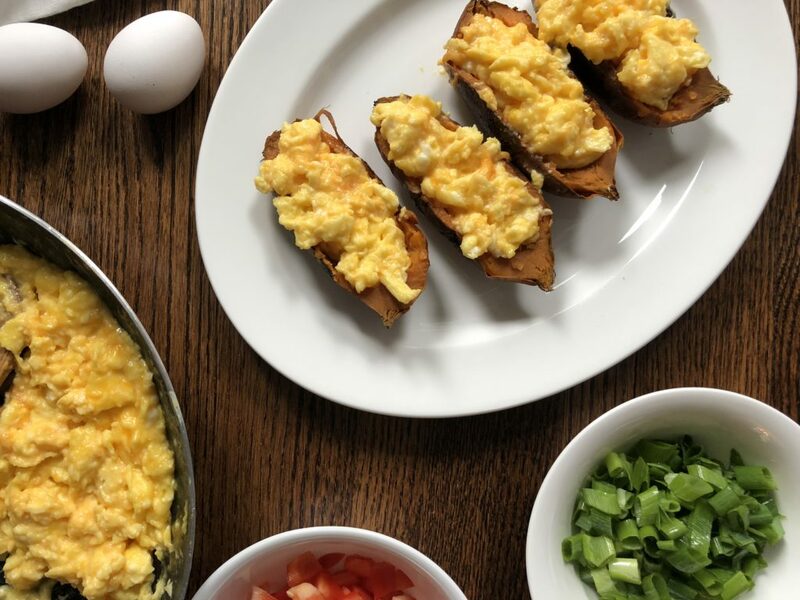 Take these Cheesy Scrambled Egg Stuffed Sweet Potatoes. The first time I made them, we actually ate them for dinner. 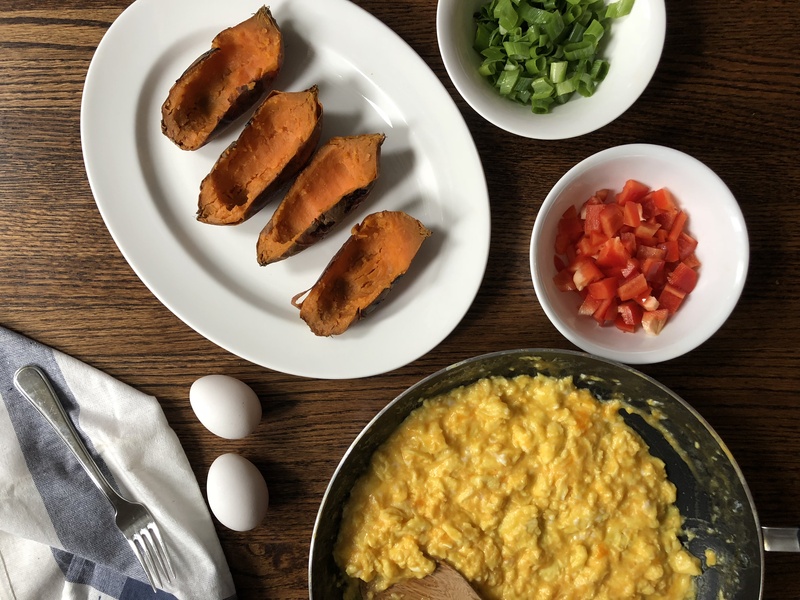 My kids can’t get enough of those creamy and cheesy eggs. And we are so lucky in Canada to have access to delicious and local eggs. Canadian eggs are produced in every province by more than 1,000 farm families. On average, eggs travel from the farm to the grocery store in less than a week. So no matter where you purchase your eggs, they are from a local farmer. A family farm that has been working together for generations to produce eggs specifically for us to enjoy with our own families. Kinda makes you feel all warm and fuzzy. Erin and I have had some amazing opportunities lately to tour egg farms and processing facilities and it’s been amazing to see how much pride Canadian egg farmers take in providing exceptional care for their hens and producing eggs of the highest quality for Canadian families to enjoy. Bottom line- Canadian farmers are hard working and amazing individuals and we are so thankful they ensure we are provided with clean, fresh, and delicious eggs. 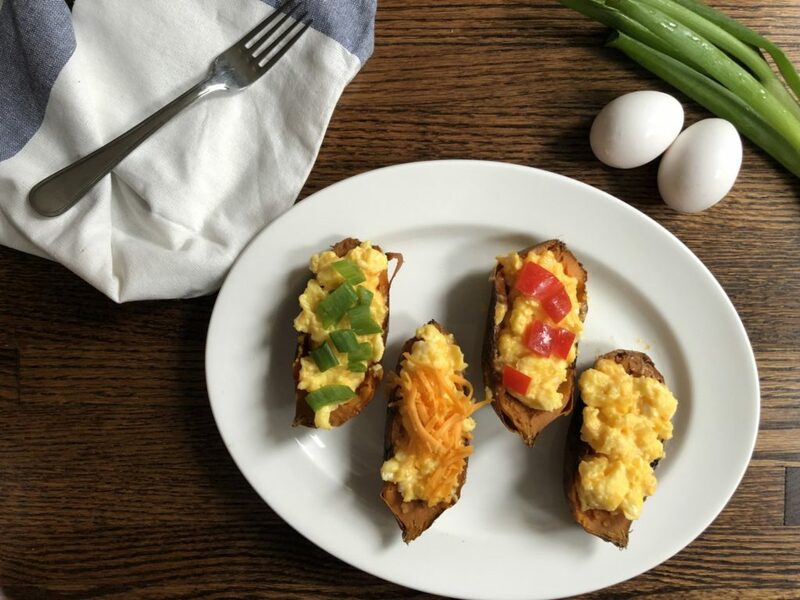 Which allows us to make delicious meals like these Cheesy Scrambled Egg Stuffed Sweet Potato Boats. I’m kind of having a moment with scrambled eggs. Creamy, slow cooked eggs in a good amount of butter, the kind you want to just eat right out of the pan. But don’t! 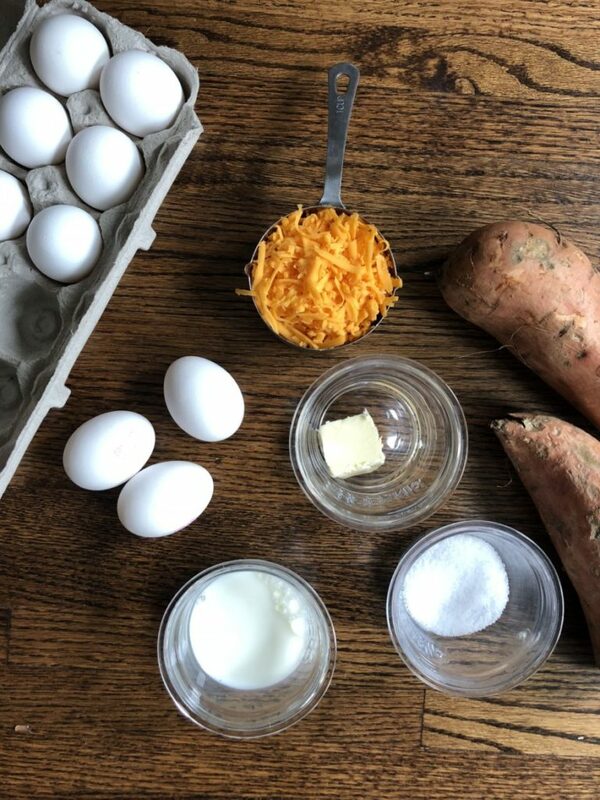 Because after they are cooked, they get stuffed into their own little edible sweet potato bowl. Perfect for grabbing on the go! In fact, you can make up a batch of these a day or two before and simply reheat them in the microwave for a few minutes when you are ready to go. Mornings are a tad crazy in my house, so any breakfast that is make-ahead-able is going to shoot to the top of my list. If you want to get fancy with these, you can top them off with some more cheese or some chopped green onion, or BACON! Or eat them straight up. I’m going to be celebrating World Egg Day by enjoying one of these bad boys. So tell me, how will you celebrate? What’s your favourite way to enjoy eggs? 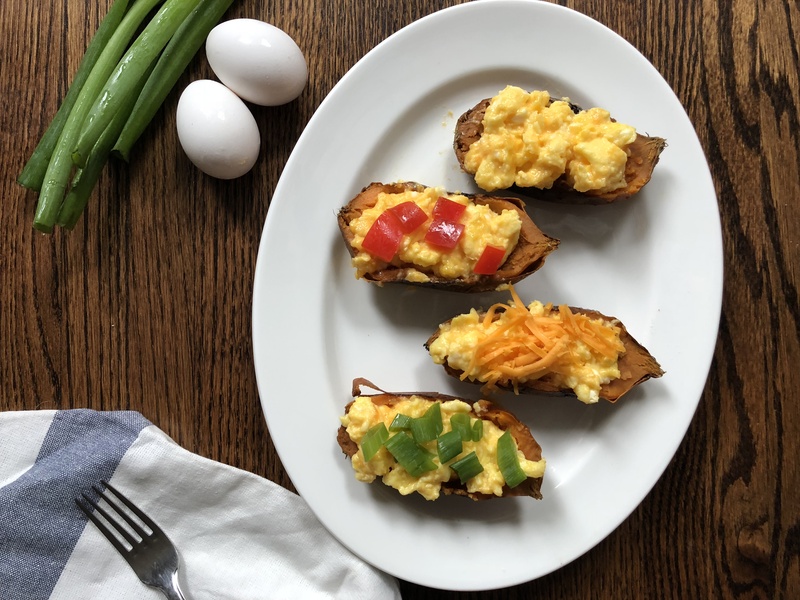 If you’re looking for some more ideas, definitely check out Egg Farmers of Canada for lots of unique and delicious recipes featuring the amazing egg! 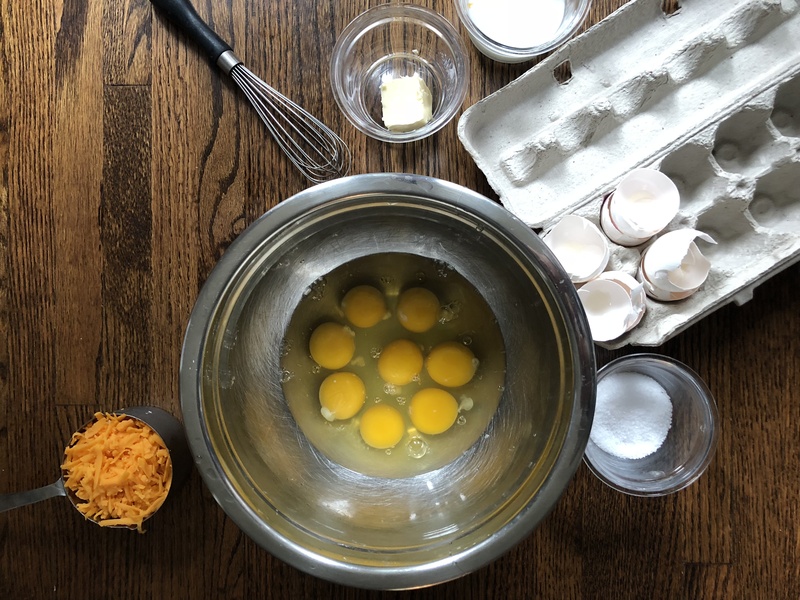 When you are cooking up your eggs today, share a photo and tag it with #WorldEggDay so we can all sit down and virtually enjoy a delicious meal of eggs together! 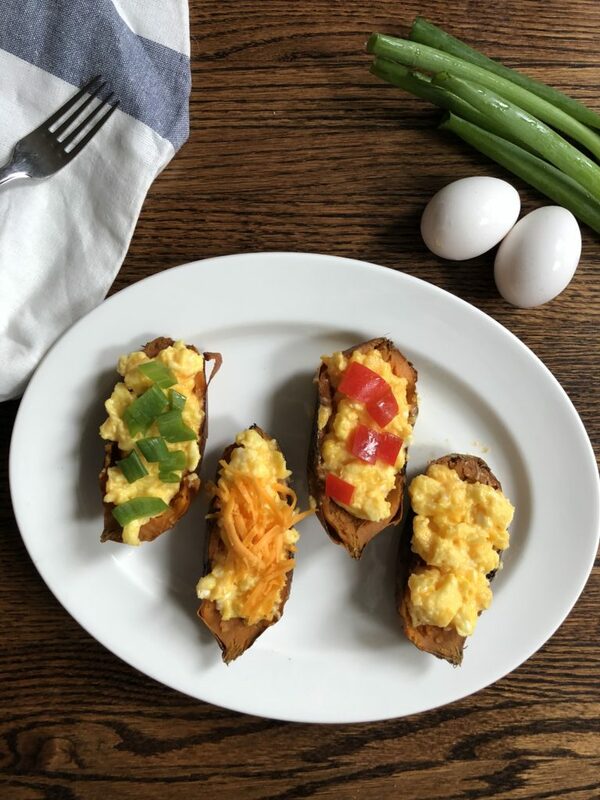 These Cheesy Scrambled Egg Stuffed Sweet Potatoes can be made a day or two in advance and reheated in the microwave for about a minute. If you are making them ahead of time, leave off the garnish until you are ready to eat. 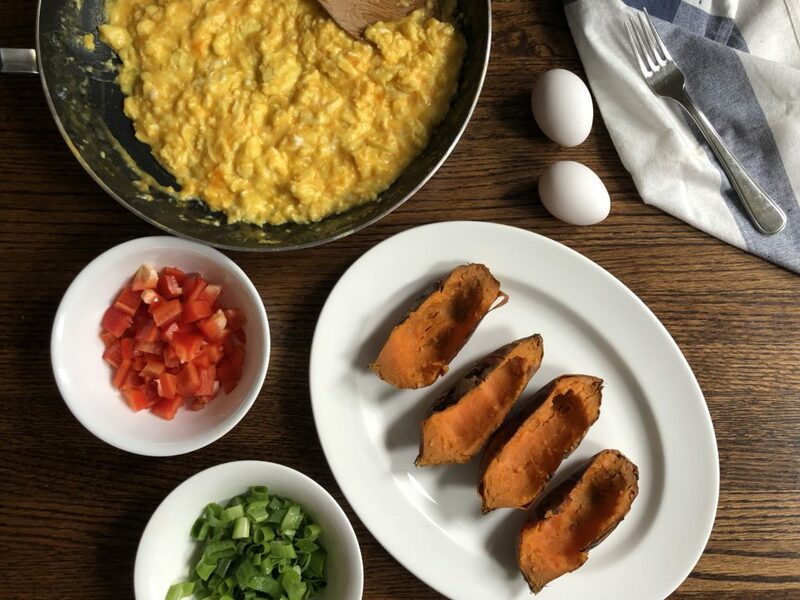 You can also cook the sweet potatoes in the microwave for a quicker option - simple microwave for about 5-8 minutes until they are soft and cooked through. 1. Preheat oven to 400 degrees. Wash sweet potatoes well and poke holes all over with a fork. 2. Place sweet potatoes in the oven for about 45-60 minutes, until very soft and starting to brown. Remove, let cool slightly, and scoop out the middle, leaving a 1/2-1 inch border. Reserve sweet potato flesh for another use. 3. Meanwhile, beat eggs, milk, and salt together in a medium bowl. Heat a large non stick skillet over medium-low heat and add butter. 4. Once butter is melted and starting to foam, add eggs and let them sit for a minute. Gently begin to push them around the pan with a wooden spoon until they are almost cooked through, but a little liquid still remains. 5. Add cheese and remove from heat. Continue to stir until the cheese is melted, breaking up the eggs into smaller chunks as you go. 6. 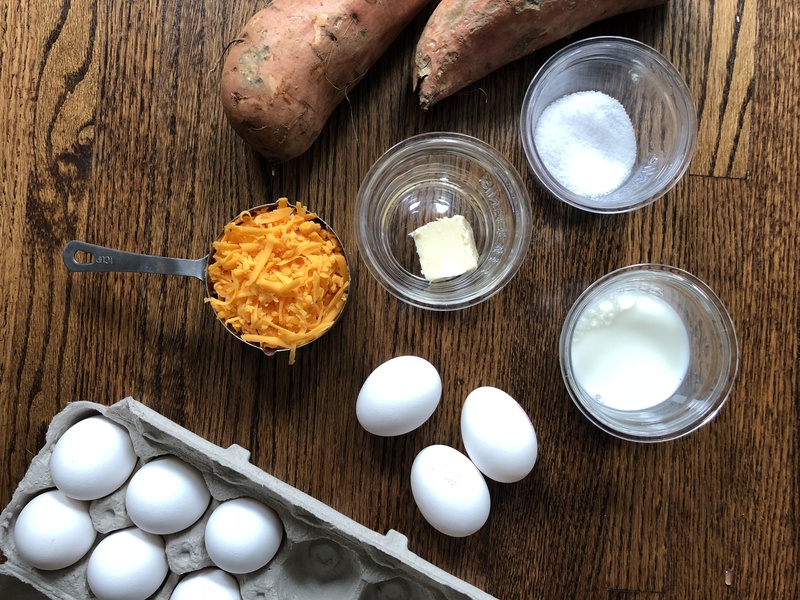 Divide eggs evenly among sweet potato halves. Top with red pepper, green onion, or extra cheese if desired.